Custom adapter for ProCurve and other LC switches. This six inch custom adapter allows for an organized transistion from your existing MTRJ cable-end to the LC port on ProCurve and other new switches. Flexible adapter allows bending for easier cable routing from any direction. MTRJ-LC adapter; flexible 6" length. This version is designed for use with multi mode 50/125 cables. Price is for each individual adapter. 24-Pack. MTRJ-LC adapter; flexible 6" length. This version is designed for use with multi mode 62.5/125 cables. Price is for a pack of 24 adapters. 24-Pack. MTRJ-LC adapter; flexible 6" length. 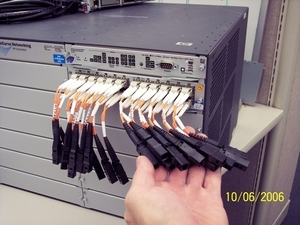 This version is designed for use with multi mode 50/125 cables. Price is for a pack of 24 adapters.